Tonight is OPENING NIGHT for the return of The Journal, a romantic improvised comedy inspired by the work of Nicholas Sparks. July 14 – 23 (8PM) at the Ballard Underground. Tickets $18 online or $20 at the door. Wayne Pishue is one of the three returning members of the cast of The Journal (2016). He has also been with SET as a performer since the very beginning, as one of the original cast members of Where No Man Has Gone Before. We asked Wayne if he’d be willing to share his thoughts on returning to The Journal; here is his reply in his own words. After 3 weeks of rehearsals, 4 days in a row of late night tech rehearsals, and not seeing my wife and dog, you might wonder what keeps me coming back – and I would answer, this show. This show is something magical. Taking what is literally some of the worst, most trite and manipulative work in literary history and turning it on its ear and into a touching show with moments of brilliant comedy and genuine tears. When I heard that we were remounting this show I was so excited. I have so much fun being silly and scary in other SET shows, but this show really lets the cast stretch their dramatic legs. It’s not often that I get to play a grieving widower, and a supportive not-played-for-laughs gay father, and a Man with a high school grudge out for revenge in the same run. This show is special in that way. We see these fully fleshed out 3-Dimensional characters live their lives and deal with real things in real ways. There won’t be a lot of aliens or mysticism in the show, but it is just as, if not more engaging that shows that feature those things. I just love the cast and I love the concept and I am so happy to be a part of this show! PRESS PHOTO for THE JOURNAL (2016): The residents of Swan Beach take issue with one of their own. 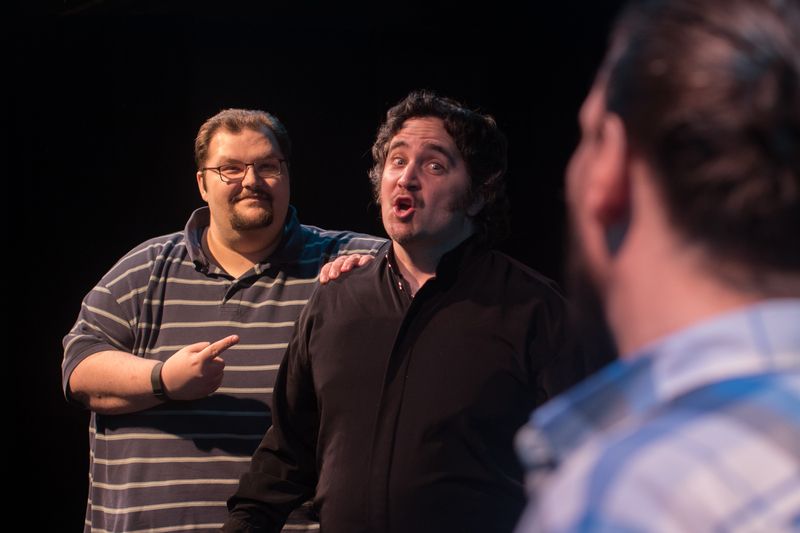 L to R: Wayne Pishue, Daryl Ducharme, Marc Guy. Intrigued? 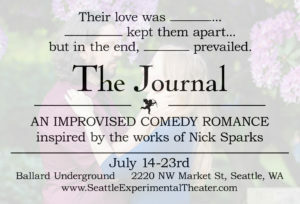 The Journal opens tonight and runs for 6 performances at the Ballard Underground in Seattle. Thursdays, Fridays, and Saturdays at 8PM July 14 – 23. Tickets available for $18 ($14 for groups of 4 or more) online at http://thejournal.bpt.me OR for $20 each at the door. This entry was posted in Behind The Scenes, The Journal. Bookmark the permalink.